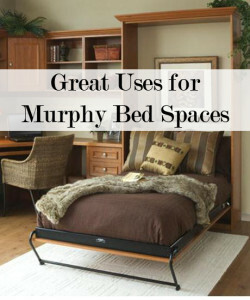 Murphy……funny name for a bed! Do you sometimes wish you had another bedroom when guests visit from out of town? Well, a Murphy bed might be your solution. A friend of mine had one installed in her sewing room. The style she chose was one with shelves on the side to accommodate some of her still needed space for her sewing and quilting materials. It is GORGEOUS! Some are built so when the bed is up there is a fold out desk to add some work space. Some are complete wall units with clothing cabinets on each side (or one side~ these little darlings are very custom). Murphy beds are great ideas for a bedroom for a college student that needs some office space, too. They are as elaborate or as simple as you choose, come in all colors and wood choices. Styles are contemporary, country, French country, craftsman, traditional, on and on. They are built for the end of the bed to pull down, BUT they are also made so that the side of the bed pulls down saving even more space. This engineering idea is a great one and accommodates a variety of needs. And when aunts, uncles, cousins, in-laws come to visit, you won’t have to throw out the old air mattress in the middle of the living room. Very nice! Hey! Maybe you already have a guest room that you hardly ever use! Get a Murphy bed and turn that unused space into an office or hobby room! Fabulous! And name your next dog Murphy! HA!